WINNIPEG, MB – Lutheran Church–Canada (LCC) is pleased to announce that Pastor Mark L. Smith has accepted the call to the position of Assistant to the President for International Missions (International Missions Executive). LCC’s Board of Directors extended the call in June and Rev. Smith is expected to begin his work on September 1st. 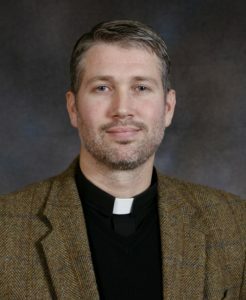 Originally from Monroe, Michigan, Pastor Smith earned his BA in theology at Canisius College in Buffalo, New York and Luther Seminary in Australia, received his M. Div. degree from Concordia Lutheran Theological Seminary in St. Catharines before obtaining an MA degree from Durham University in the UK. He has served in a variety of positions: an LCMS lay missionary to Papua New Guinea; volunteer coordinator for the African Refugee Program of the Lutheran Church of Australia; Missionary-at-Large and Pastor of St. Timothy’s in Sunderland, UK; seminary instructor in Nicaragua and Haiti; and Pastor of Zion Lutheran Church in Plumas, Manitoba. He is currently serving as the LCC East District’s Circuit Rider in the St. Andrew’s parish of Atlantic Canada, which includes Halifax, Annapolis Valley, Prince Edward Island, and Newfoundland. Pastor Smith will succeed Rev. Dr. Leonardo Neitzel who retired at the end of April, 2018. As International Mission Executive, Pastor Smith will be responsible for mission and social ministry programs offered by LCC. The duties of the position include providing oversight of the current mission and social ministry programs, exploring new mission opportunities and strategies, and developing funding strategies for the support of missions and social ministry. Smith will also provide oversight of social ministry programs, communicate the mission work of LCC, represent the president to districts, mission oriented-auxiliaries and agencies, act as LCC Liaison with Listed Service Organizations, and and other duties as required. Lutheran Church-Canada’s Board of Directors is also seeking nominations for an Assistant to the President for Domestic Missions (Canadian Mission Executive) who will coordinate and lead our mission and social ministry outreach in Canada. Full position details are available HERE. Deadline for nominations is September 15, 2018.